I’m always amazed by how much history I didn’t learn about in school. Learning the story of the Algiers Motel incident during Detroit’s 1967 12th Street Riot, I felt a wide array of emotions. I’m always interested in watching movies based on true stories, but I have to admit this movie hit me to the core. And after leaving the theater I realized there are many more stories from these riots that need to be told, including the perspectives of Black Women. Living in 2017 and still seeing incidents of police brutality and witnessing Black people facing the same struggles as 1967 is disheartening. 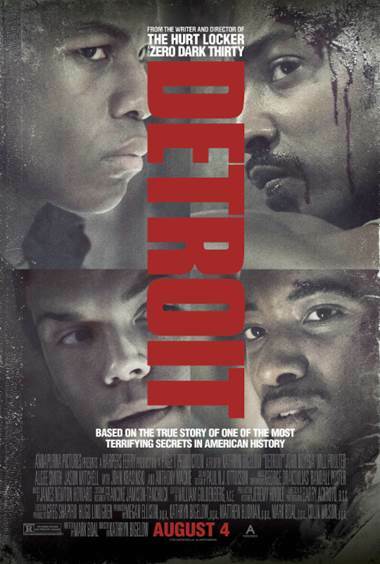 I think Detroit is a MUST SEE movie, but I also believe you have to see it when you’re ready to deal with the feelings it will invoke. The movie shows such harsh realities that there were many times that I couldn’t even look at what was on the screen and I also shed tears. Something I really appreciated was showing how the police treated the white women involved in the incident also. It shows that police brutality isn’t something that just affects minorities, although it does affect us MUCH more. I honestly don’t know how you can watch this film and not consider why more effective changes haven’t been made. Detroit is a reminder of how far we’ve come in some regards but how much further we really have to go. It’s also a reminder that Black Lives Matter. I recommend everyone checking out the movie, it’s going to be uncomfortable for everyone to watch but it’s definitely a reality we ALL have to face.